The campaign will run through December. 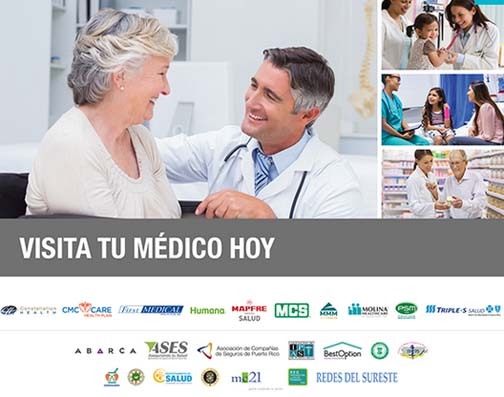 An alliance comprised of multiple health insurers, service providers, industry associations and the government of Puerto Rico announced the start of an outreach campaign titled “Visit your doctor today,” which aims to help patients seek preventive care and better manage existing health conditions through regular visits to their primary medical doctors and specialists. Puerto Rico Health Insurance Administration (ASES for its Spanish acronym) Executive Director Ángela Ávila and Health Department Secretary Rafael Rodríguez-Mercado in a joint press conference with the sponsoring companies and professional associations issued an urgent call for citizens to resume medical care through their doctors. “The ‘Visit your doctor today’ campaign seeks to normalize the procurement of health services by our citizens as soon as possible,” said Ávila, campaign spokesperson. “If you are unable to contact your primary doctor please contact your health insurer or refer to the provider directory that we have prepared to help patients in the process,” she said, adding ASES has developed a health service provider directory using information provided by health insurers for digital and print distribution as a complement to the media campaign. The directory includes contact and working hour information for primary medical groups, specialists, pharmacies, hospitals, laboratories, diagnostic and treatment centers, dialysis clinics and radiology services centers. The alliance behind the “Visit your doctor today” initiative includes 10 health insurance companies: Constellation Health, CMC Care, First Medical Health Plan, Inc., Humana, MAPFRE, MCS, Molina Healthcare, MMM, Plan de Salud Menonita and Triple-S –, as well as ASES, the Puerto Rico Health Department, the Office of the Insurance Commissioner, Best Option Healthcare, Redes del Sureste, the Insurance Companies’ Association of Puerto Rico (ACODESE for its Spanish acronym), the Pharmaceutical Industry Association, the Independent Providers Association de PR, Primary Healthcare Association, COOPHARMA, the College of Medical Doctors and Surgeons, the Puerto Rico Pharmacist Association, Abarca and MC-21. “This campaign is critically important to prevent the spread of diseases and support easy access to medical care in the face of the serious public health emergency created in the wake of hurricanes Irma and Maria,” said Ávila, of the effort that runs through December. Hey Buddy!, I found this information for you: "Health sector alliance launches effort to drive patient visits to doctors". Here is the website link: https://newsismybusiness.com/alliance-launches-patient/. Thank you.